Exchanging a dozen of your fresh eggs for a jar of your neighbor’s honey was once standard practice in small towns and rural communities. 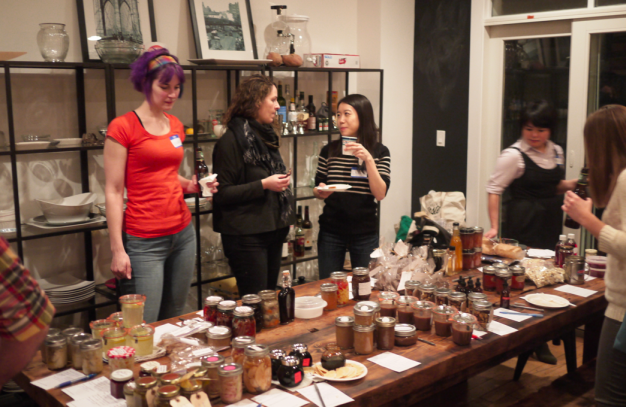 This friendly and practical barter of goods is now experiencing a revival in cities across the country by like-minded food enthusiasts through highly organized food swaps. BK Swappers, founded in 2010, is one such group that my dear friend and fearless-home-cook, Jane Lerner is behind. I got in on the action last month, and discovered how this pantry-stocking-swap works. 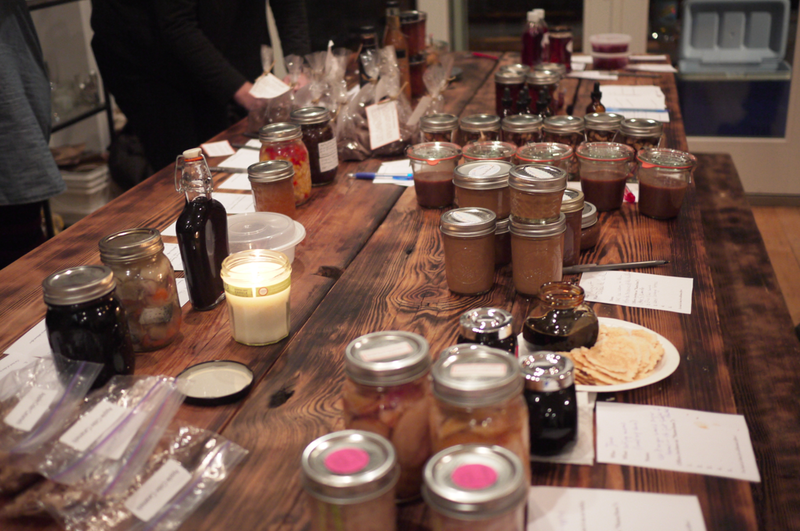 First, you have to show up with something to trade, and everyone brings up to 10 jars, bags, bottles or tins of whatever they’ve preserved, pickled, baked or stirred up. This being my first swap, I went with a safe bet and just made a giant batch of spiced nuts. 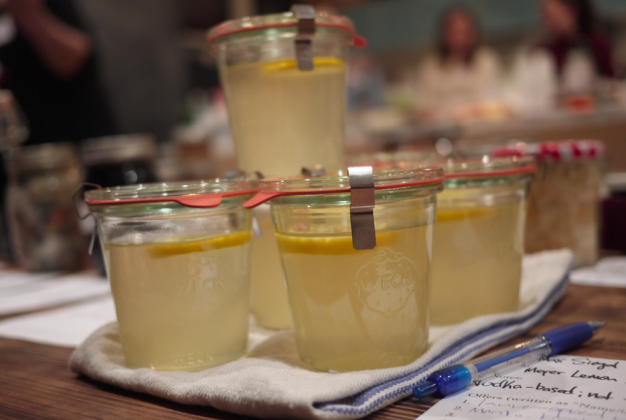 However, this event is not for those shy around the kitchen – there was kimchi stuffed sausage, Meyer lemon limoncello and orange bitters in amber-hued tincture bottles, to name a few items. Everyone snags a space to display their wares. 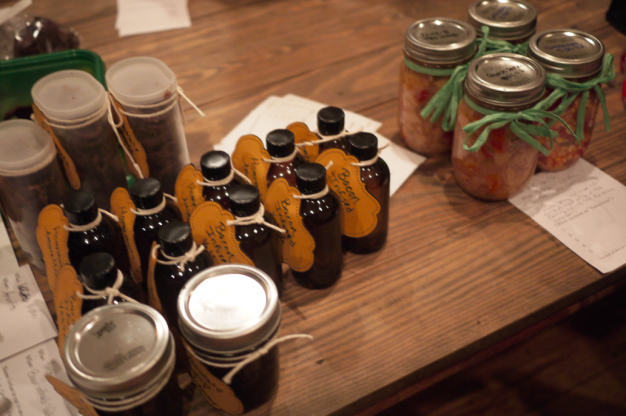 They also fill out a swap sheet with a description of their goodies, and then others can write in a proposed trade for your treat (for example: My jar of Sichuan chili pepper oil for your bacon-infused vodka). 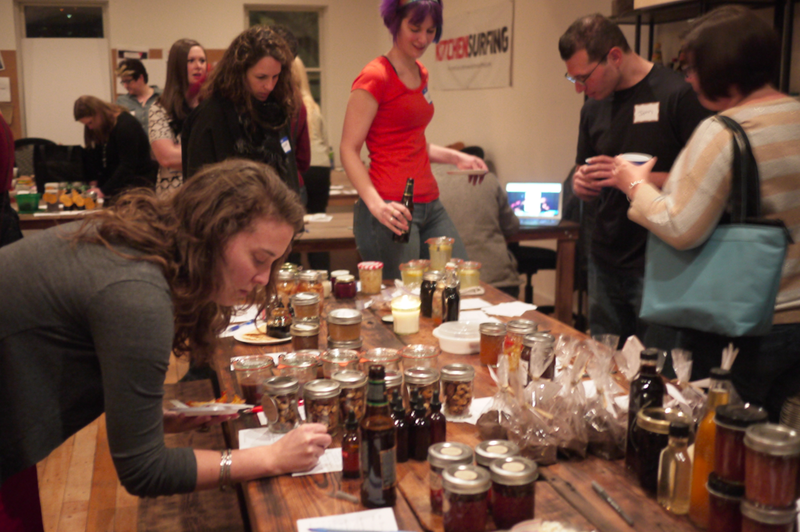 Trick of the trade: having a little tasting sample set out to entice fellow swappers. It’s a very social affair. In addition to all the nibbles on the swap table, people bring pot-luck style dishes to share, and one swapper had even set up a knife-sharpening station. Just as if you were at the most delicious (and ambitious) cocktail party ever, folks stand around chatting and clinking beer bottles in-between bites of lavender shortbread or a scoop of pepper-infused jelly. All is casual and friendly… until the call to swap. This is where things get serious, and a bit hectic. Seasoned swappers circulate quickly to pounce on those chocolate-covered pretzels or tangy pickled Brussels sprouts they’ve been eyeing. The uninitiated (ok, me) hung back and tried their luck after the initial rush. No matter your swap style though, no one walks away empty-handed or without something new and different to try. After all, who couldn’t use a jar of peppery giardiniera or homemade butternut squash butter? Does your pantry need a spring re-stock? The next BK Swappers event is Thursday, April 24 at the West in Williamsburg. Spaces can be reserved starting this Friday, April 4. Join their mailing list for the full scoop. Happy swapping! This entry was posted in create and tagged BK Swappers, Brooklyn, food barter, food swaps, home cooks, Jane Lerner by lhouse. Bookmark the permalink.